Roadsoft is based on a linear referenced map and associated data structure of a jurisdiction’s road network. The map provides a visual representation of the various assets in the jurisdiction; the data structure provides a means for data storage and retrieval. Getting started with Roadsoft begins with a map. Our customers typically have an existing map from their legacy system which we review and convert for use with Roadsoft. Maps from legacy systems must meet the minimum requirements. Map data must include center line data. Jurisdictional polygons (counties, townships, cities, etc.) are accepted, but optional. File format is typically a series of shapefiles; however, we can work with most GIS formats. End points and intersecting points of vectors must "snap" together precisely, which means they must touch at ends (not overlap), be continuous, include no loops, intersect at the same elevation, etc. We will work with you to identify any questionable points so they may be resolved prior to map conversion. 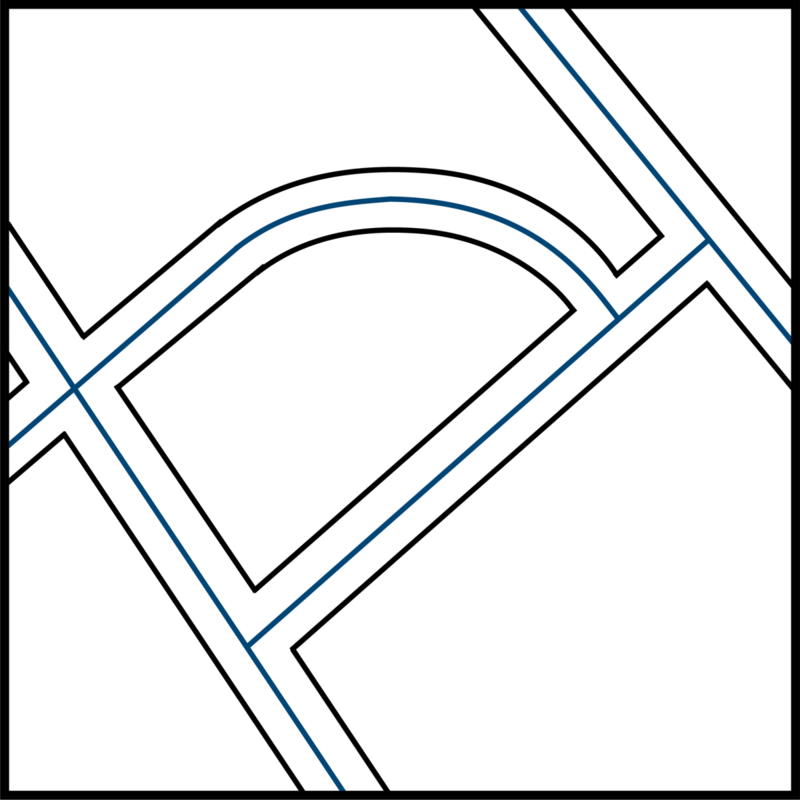 Road names in Roadsoft contain four parts: Prefix, Name, Type, and Suffix. The Name field is required, the rest are desirable, but optional. Agencies may have access to other data that are not required, but will prove to be useful in Roadsoft. National Function Class, Physical Reference Numbers, Jurisdictional Boundary Polygons, and Route Numbers are datatypes we can work with in preparation for the map conversion process. All United States roads have a National Function Class (NFC) for function classification of streets, roads, and highways. NFC is useful for organizing, studying, and comparing roads. We use either, or both, city and township polygons as a visual frame of reference, and also for creating road splits across the jurisdictional boundaries. Physical Reference Numbers allow the combination of segments, simplifying the map and underlying data structure. PR numbers can help to minimize excessive segmentation. Similarly, we also use route numbers (in conjunction with or instead of PR numbers) if they are available. Route numbers can also provide a means for combining segments. Roadsoft is individually licensed to local agencies (One County, City, Village, Township, Planning Region, Native American Indian Tribe or other singular public agency). Licensing includes unlimited seats within the licensing agency, software updates, access to online help documentation, 36 hours of telephone technical support, and use of all special utilities included in the software suite (Laptop Data Collector, Roadsoft Mobile, Roadsoft Database Manager, etc.). Multi-Agency licenses (statewide, region, etc.) are negotiable. Licensing includes all modules with the exception of the Crash and Bridge Modules. Data migrations, on-site training, agency map correction, Crash Module, and Bridge Module are available under additional licensing. Licensing renewal notices are sent annually. Roadsoft remains operational when licensing expires; however, access to technical support ceases. Expiration of the license beyond 12 months requires the purchase of another Initial Year license. Once we receive your map data sample, we will verfiy map conversion feasibility. Typically this takes 1 to 4 days. In order to ensure we will be able to convert your existing map data to fit our map framework, we will request a map data sample. The process for getting Roadsoft typically starts with a demonstration of Roadsoft's features. Once we receive your request for a demo, our staff will work quickly to schedule the best time. Roadsoft demonstrations are conducted virtually. Installable demo versions of Roadsoft are available upon request. When we determine map data conversion feasibility, we will begin the licensing process with you. Once we receive your signed license agreement and payment, we will request your full map dataset. Upon receipt of your full map dataset, we will complete map data conversion for Roadsoft. Typically this process takes 2 to 3 weeks. Once the map is converted, we will work with you on Roadsoft installation and confirm accuracy and usability of the Roadsoft map converted from your map data. For agencies outside the state of Michigan, Roadsoft is available under license agreement. To receive more information, the link below will redirect to our demo and information request form. After submitting the request form, a staff member from the Center for Technology & Training will respond as soon as possible.